WASHINGTON, D.C. -- Sixty-one percent of Americans favor stricter laws on the sale of firearms, down modestly from March, when 67% said this shortly after the Parkland, Florida, school shooting on Feb. 14. The current reading is similar to the 60% measured last fall after the Las Vegas mass shooting. Along with March, it reflects the highest percentage to favor tougher firearms laws in two or more decades. These data come from Gallup's latest survey, conducted Oct. 1-10, as the 2018 midterm elections draw near and gun control proponents have gone on the offensive to make tighter laws a major issue for voters. 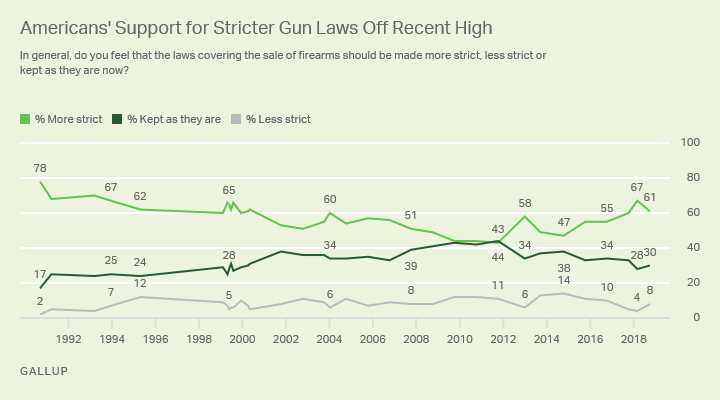 Support for stricter gun control was at its highest when Gallup first asked Americans about their views on tightening firearms restrictions in 1990. At that time, 78% in the U.S. favored stricter gun control. Sentiment favoring tougher gun laws remained at or near 70% through the end of 1993; in 1994, the U.S. government passed the Brady bill and an assault weapons ban. After the passage of these regulations, support for tougher gun control waned, decreasing to 62% in 1995 and bottoming out at 43% in 2011. Support for stricter gun laws typically rises in the immediate aftermath of a mass shooting, only to fall again as the incident fades from the public's memory. For instance, after the December 2012 shooting at Sandy Hook Elementary School in Newtown, Connecticut, support for stricter gun control jumped to 58%, though it fell to 49% less than a year later. Despite these occasional spikes and drops, support for tougher gun laws has generally risen since 2014. Nearly nine in 10 Democrats, 87%, are in favor of stricter gun laws, compared with just 31% of Republicans, a gap of 56 percentage points. Democrats' support for tougher gun control is little changed from the 90% who favored it in March, after the Parkland shootings. However, Republican support for tighter controls on firearms has fallen 10 points from 41% since Parkland. The Republican drop in support for tougher gun control legislation has been the primary driver of the overall drop in support for such measures among all Americans. 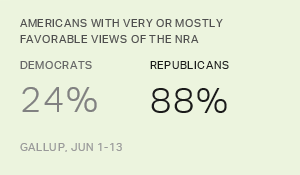 However, support for stricter gun control among all three partisan groups is only modestly different from what it was one year ago. 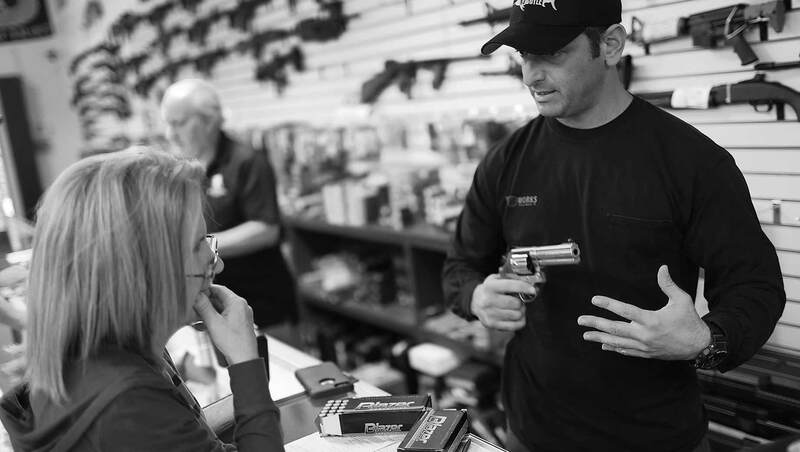 In general, do you feel that the laws covering the sale of firearms should be made more strict, less strict or kept as they are now? Gun ownership is also, unsurprisingly, a key indicator of potential support for tougher gun control laws. Americans who don't own guns (73%) are nearly twice as likely as gun owners (38%) to support tougher gun laws. 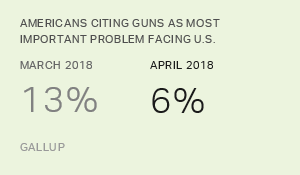 Even among gun owners, though, there is little support for loosening firearms laws, with 11% favoring less strict gun control legislation. Gun owners are most likely to favor keeping gun laws as they are. While a clear majority of Americans support tougher gun laws, the U.S. public is substantially less supportive of an outright ban on handguns. Fewer than three in 10 Americans, 28%, support a handgun ban, unchanged from last October. Americans' support for a handgun ban has been below 30% since 2008. Even among the groups most supportive of a handgun ban, less than a majority say they favor it. Among Democrats, for example, 42% support such regulation, compared with 10% of Republicans. Americans' support for tougher gun legislation typically fluctuates, increasing in the wake of a mass shooting and dropping as memory of those horrific events fades. However, the broader recent trend has been an increase in support for tighter regulations. Partisan differences in views on gun control and on the favorability of the National Rifle Association likely indicate that primary elections have served as a litmus test ensuring that most Republican candidates are opposed to stricter gun control, while most Democratic candidates support increased regulation. Current support levels for tougher gun control would tend to indicate the issue would be an advantage for Democrats, though with the recent drop in support for tighter legislation, not to the extent it was seven months ago.